The jig is up: Big brands like J. Crew, Gap and Saks’ Off 5th aren’t selling you discounted or out of season merchandise at their outlet locations. You’re just buying lower quality cardigans and patterned pants. Scandal. And last week, J.Crew got greedy, it seems. 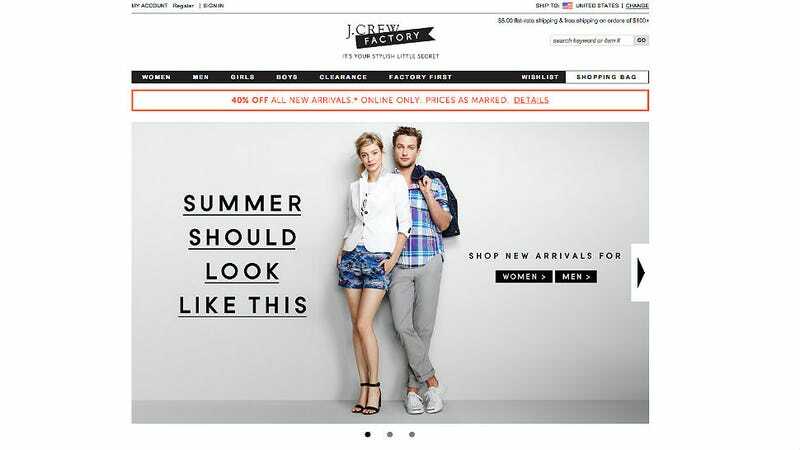 According to Buzzfeed, reports surfaced that the company might open a discount chain called J.Crew Mercantile. I’m all for a discount, but what does a discount of something already made to be discounted even look like? Will it fall apart in the wash? Family, I come to you whole-heartedly admitting that I am an avid contributor to J.Crew’s snake oil factory outlet line. In fact, I look forward to hitting up their stores every time I visit an outlet mall because I can get the fashionable J.Crew items, which I refuse to pay full price for, and a high possibility for a ‘buy 2 get 1 half-off’ discount. What’s not to love? But as a veteran of the outlet model — you’re reading the words of a veteran teen outlet sales associate at Levi’s and Reebok — I’ve known those products weren’t rejects since the late 1990s. Back at Levi’s, I could tell which pieces were damaged; a button would be missing or zipper wouldn’t slide properly. But by the time I moved to Reebok around 1997, our store would get new products sent to us that were just made of less sustainable material but not damaged. Even now, when I go to a Vans outlet, it’s clear that the products sold there are of a lower quality than ones you’d find in a proper store. But if the pair of shoes is only $20, it’s worth the cost to me as a consumer. But some disagree, pointing out that if big brand outlets loom larger than their main stores, that divergence can be damaging. Not to mention the opportunity for dishonest pricing on consumer websites like Saks’ Off 5th, where a Rag and Bone dress might be “marked down” from $325 to $122.99 when it was never listed at the original price in the first place. In fact, the designer might’ve never intended to sell the dress anywhere but Off 5th or for more than the "discounted" price listed. This practice, of course, is not cool. Some in congress have asked the Federal Trade Commission to look into this “potentially misleading marketing practices by outlet stores,” because customers can’t always tell which items they’re actually getting for a sale price. Some stores like Gap will put three dots on the tags of clothing that's made for the outlets. Still, since 1997 an increasing number of brands have begun making lower-priced items specifically for their outlet stores, and it's profitable. In the past year, Bebe has said it believes it can sustain outlets with 65% made-for-outlet merchandise, while American Eagle has said it anticipates carrying 75% made-for-factory items starting this year. Under Armour said in September that its outlets have recently carried 75% made-for-outlet goods, while Children’s Place said its proportion is closer to 80%. Coach and high-end luggage maker Tumi have said 85% of their outlet goods are made-for-factory. Vera Bradley said it plans to carry more made-for-factory items because it has learned it’s downright problematic to carry retired designs “right on the heels” of selling them at full price. But adding to the confusion, you have some brands at the other end of the spectrum, like Lululemon, which carries only genuine excess inventory in its outlet stores, and Abercrombie, which only recently started testing two outlet stores with made-for-factory product. Hey, it’s a pricey jungle out there and if I can get one of those J.Crew necklaces I love so much for less than the ridiculous $75 main store price tag, so be it. As Sheryl Crow once said, "Lie to me, I promise, I'll believe."